As thrilling as race day is for fans, nothing beats being a Girl Scout with the vision behind a personally designed, hand-built car as it crosses the finish line at the equivalent of 200 mph. 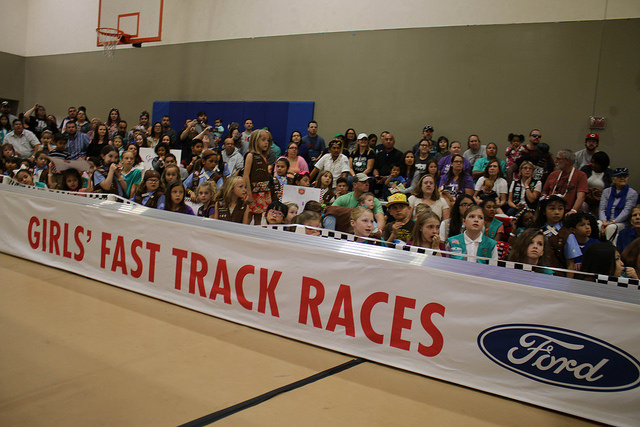 And no, this isn’t a professional car race—it’s the Ford Girls’ Fast Track Races! Throughout 2017, Ford Girls’ Fast Track Races brought pine car racing to Girl Scout Brownies and Juniors in Colorado, Florida, Georgia, Illinois, California, Michigan, New Jersey, and Texas. 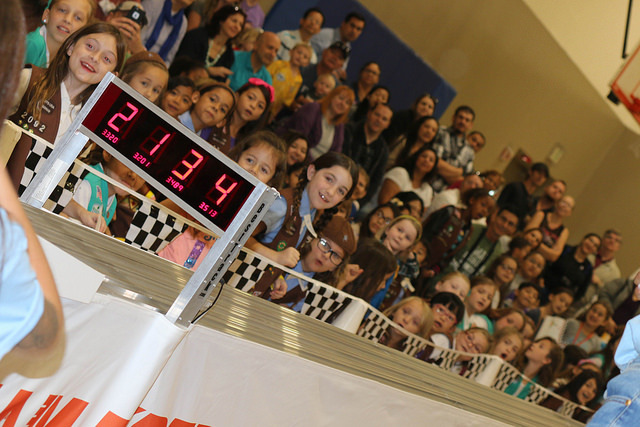 By putting their STEAM knowledge into action and with help from Ford and Society of Women Engineers members, girls got hands-on experience in engineering, design, aerodynamics, and weight distribution as they built and competed their very own wooden race cars. They even got to put their own personal stamp on their cars—for instance, by designing them to look like blocks of cheese and adding rabbit ears and glittery racing stripes! 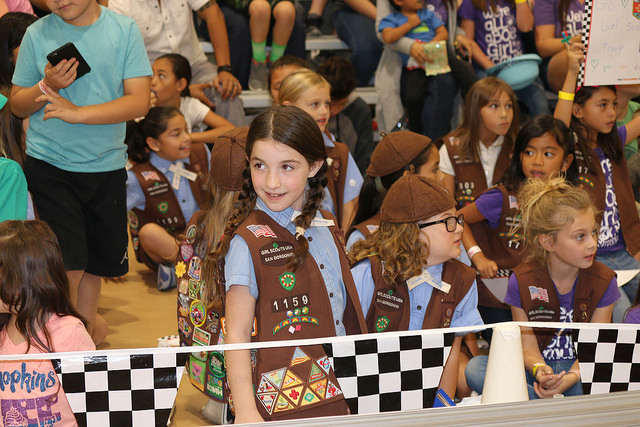 To learn more about the Ford Girls’ Fast Track Races and what they mean to participating Girl Scouts, we talked to Carrie Raleigh, STEM program manager at the Girl Scouts of San Gorgonio Council, about race day in California. What was race day like? What did the girls experience that day? Race day was full of excitement for the girls. They were prepared to race, proud of the cars they had built, and most of them were able to explain why they thought their design would win. They were proud to have decorated their cars to represent their sports interests, personalities, hobbies, or Girl Scout pride, and they beamed with joy when they were given compliments on how their cars looked. Families were excited to come see the girls be a part of the event. Some even brought signs to show their support! The enthusiasm of the Ford staff on site was contagious and the girls were excited to interact with the Ford and Society of Women engineers member at the event. What’s been the general response—from volunteers, parents, and the girls? It was truly amazing to see how many family members came out to watch the races. Some girls had three generations there to cheer them on! When the girls were showing off their designs, they made sure to tell how moms and dads helped them “do this part” but then pointed out what they did all by themselves. Every family walking out the door that day thanked us for having Ford come to host this event, and we have continued to hear positive comments and appreciation from the parents and girls. Were there any gender stereotypes you confronted and needed to overcome in connection with this event? We never heard a single Girl Scout say she couldn’t do this because she’s a girl. Once the process of the “build day” was explained, the girls had no problem taking control of their project. And there were a couple of parent comments about being glad to see this opportunity for their girls as their sons had participated in similar programs. Are there any lessons you noticed girls learning throughout the race season? One Girl Scout cut her car incorrectly, and according to the race guidelines it was too narrow. Instead of getting mad, upset, or asking for a new one, she watched very patiently as the volunteers tried to come up with a solution. She completely acknowledged that if she had paid attention during the presentation, she would have known it needed to be wider. She immediately recognized where it had gone wrong, vowed to correct herself in the future, and was patient enough to allow people to help her correct the mistake. Her car was eventually fixed, and she did very well during the race. What made the girls really excited about the event? I loved the way the girls wanted to take ownership of their build. They wanted to draw the lines to be cut and talked with their parents about the aerodynamics of a car and why they thought it would go faster it they designed it a specific way. They took pride in how they were able to be hands-on during the process, and they enjoyed creating a personalized look for a car that was all their own. How do opportunities like the Ford Girls’ Fast Track Races open up a world of possibility thinking for girls? What benefits do you see these types of events providing girls who participate? These kind of opportunities expose girls to ideas and career paths they may not otherwise encounter. It truly could change the course of life for one of our girls. [Through the Ford program], girls are empowered to see themselves as capable of rising to any challenge. The positive atmosphere of the event made the competition fun and engaging for girls, no matter how well their car performed; the shared experience was the important part of the day, not who won. The girls are learning to be supportive of one another as well as learning design concepts. Do you have a favorite moment from the race season? On race day, we had one girl talking to us about her previous run. We were giving high-fives because she’d won, but she didn’t realize her car would be racing again very soon. Several girls came running over to grab her hand, telling her she was going to miss it. Even though her friends had lost, they wanted to make sure she saw her car race—it was a great “Girl Scout sister” moment. The screams and cheers and hugs after each race were so inspiring to watch. 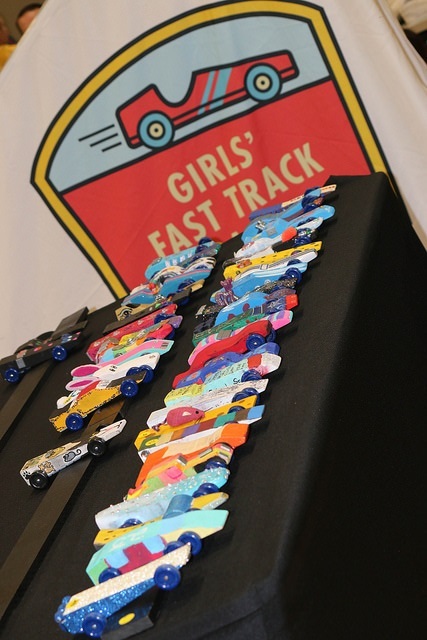 Clearly, Ford Girls’ Fast Track Races are a ton of fun—and the valuable STEAM skills girls learn along the way will stay with them long after the checkered flag waves! Read more about the Ford Girls’ Fast Track Races.